Brooklands in Surrey is the spiritual home of British motor racing being the site of the first purpose built race track back in the 1920’s. Today, most of the circuit has disappeared but the museum retains much of the atmosphere and style of the first golden age of racing. 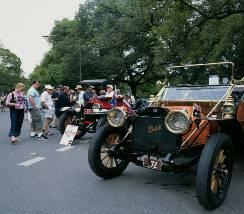 In keeping with the theme of the day; the group will take a step back in time as suitably attired in period gear (complete with aviator goggles) they climb aboard the fleet of vintage vehicles (each one with a driver) to head off on a recreation of that essentially eccentric British event – The London to Brighton Run.